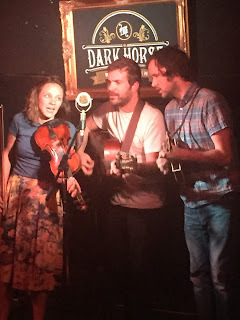 Three Chords and the Truth UK: Mandolin Orange - Dark Horse, Moseley, Birmingham. Thursday 5th May 2016. 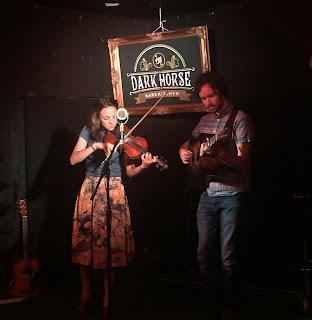 Mandolin Orange - Dark Horse, Moseley, Birmingham. Thursday 5th May 2016. If Mandolin Orange has been on the periphery of my horizon for a while, they parked at the front door last night with a debut show in Birmingham. This duo from North Carolina have been hoovering up praise for quite a while and reside in good company since their last albums were released on the Yep Roc record label. The latest UK tour sees the pairing of Emily Frantz and Andrew Marlin pay a visit to the usual Americana and roots haunts with the addition this year of a visit to Birmingh-u-m (no errors in pronunciation from the band). It appears that this was the same team that put the Bros. Landreth show on in March and similarly this event was also impeded by a venue change. While it is laudable that such fine artists are being brought to the area, surely word needs to get out more that great music is in town. 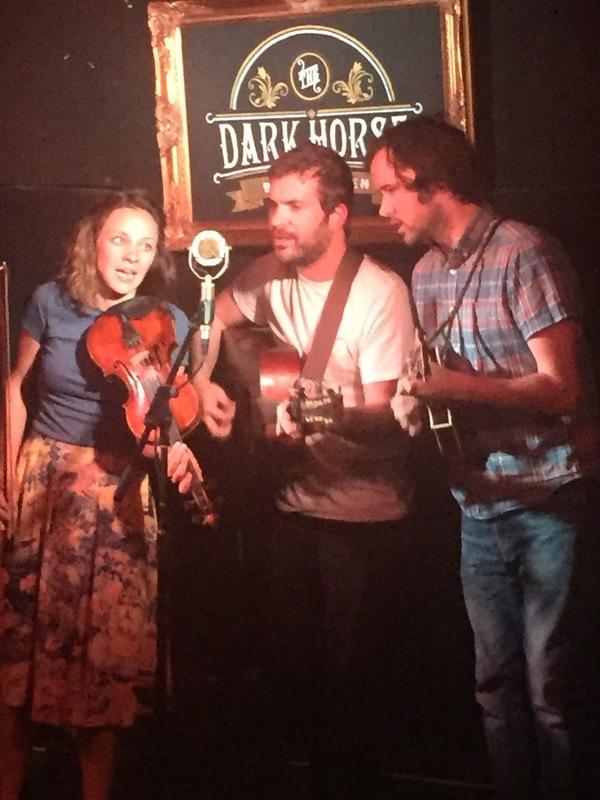 Those last few words are indisputable on the evidence of Mandolin Orange’s performance in the upstairs room of Moseley’s Dark Horse pub. Pouring their authentic vocals and harmonies into a single vintage mic, multi-instrumentalists Emily and Andrew delivered a stunning set of old time, bluegrass and country music, as rustic and rural as you can get. Yes, the mandolin was prevalent and Andrew’s spectacular playing extracted some searing sounds with the surprise of no broken strings. While Andrew was picking his magnificent miniature instrument, Emily supplied the rhythm from her acoustic guitar. Frequently roles were reversed when Emily reverted to fiddle and Andrew replaced the mandolin with guitar. Whatever the format, the results were smooth and rousing to the ear. Vocally, Andrew generally took control with the harmonies sprinkling parts of most songs. The live versions of their recorded songs adopted a living breathing role and accomplished the feat of enticing a string of album purchases. The evening began with local singer-songwriter Guy Jones getting a rather early slot, which from experience always seems to get more audience focus in a seated venue. Guy is a regular on the circuit and is steadily growing his presence with a bunch of strong confidently delivered songs. If Guy was the familiar support, the next artist up wasn’t and he transpired to be the travelling companion of Mandolin Orange. A little post-gig research reveals Josh Oliver as an active performer in the East Tennessee/North Carolina area with a recent solo record put out featuring Andrew and Emily in both playing and production capacities. 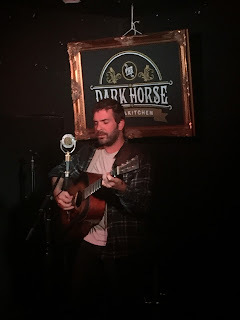 Within seconds of Josh playing the first song of his short set, you felt you were in the presence of an artist straight from the backwoods of the Deep South. While the lyrics were a touch tough to follow from such a strong accent, the sound had 100% guaranteed quality stamped all over it. Not too many of the songs can be recalled, but he did pay tribute to an artist he has played with who I’d heard of – Martha Scanlon and covered the Carter Family piece ‘When the World’s on Fire’. Now that is one act he would have surely loved to have played with in another era. While on the topic of covers, Mandolin Orange slipped in a lengthy version of Bob Dylan’s ‘Boots of Spanish Leather’ mid-way through their set admitting that it would be difficult to follow such an impeccable song. However the guys need not have worried as their own songs sounded superb and are built to stand the test of time. Emily informed the audience that the latest album was celebrating its one year release birthday on May 5th and several tracks from SUCH JUBILEE featured during the show. The pick of these were ‘That Wrecking Ball’ and a cowboy song going by the title ‘Rounder’. Since their formation in 2009, Mandolin Orange haven’t held back on the releases and this evening a couple more new songs were previewed suggesting another one is just around the corner. If one song had to be elevated to pole position on the set list, ‘Waltz About Whiskey’ from the 2013 album THIS SIDE OF JORDAN made a compelling case. An evening of personal discovery and enlightenment ended with a jam exhibition on stage as Josh joined Emily and Andrew for the final three numbers. This segment of song sharing capped a fabulous show with the confirmation that another top of their game American roots act is making a growing impression this side of the pond. The final thoughts of comparison have already been referenced in Mandolin Orange’s press, but the resemblance in style to Gillian Welch and David Rawlings isn’t going away. However to throw another name into the mix, the appeal and effect from a personal perspective was that from seeing The Stray Birds live for the first time last year. That trio were totally awesome, and the duo Mandolin Orange is in the same league.